It’s a “flash mob” of writers. Every Friday at 12:01am a few hundred (or is it closer to thousand?) women pop on over to Lisa-Jo’s page to find out what the word of the next 5 minutes will be. No extreme planning and linking and photographing. Just FIVE minutes of writing to see what comes out. Who knew Ohio could be so scary? Long regarded in my mind as a place of beauty and Americana, nothing prepared me for the treacherous journey the orange hair, freckle face olive shoot and I would have both coming and going to Chicago. Fog hung in the air like mucus and there was no relief from the patches of blindness. I couldn’t pull over because I couldn’t see any exits and I was terrified to stop my car off the side to the shoulder because I was certain a truck would plow through my vehicle. Only a rail would have possibly shielded Ike and I from driving off the deep ravines but I’m not even certain there was a rail. It was only after telling a friend of my harrowing travels that I learned there was something like this on the stretch of highway. I’ve been driving since I was 16 years old and never been more frightened behind the wheel in my life. (This experience was only matched by the drive back from Moody Bible Institute and I’m not prepared to write about it yet). My nerves were frazzled and we stopped after the fog had cleared. Hungry and needing a potty break, Ike and I paused at a restaurant at a nearby exit. I had forgotten that we had entered Amish country but judging from the simply clad little boys in the front of the restaurant and the young lady working behind the counter, I soon realized seeing me with my pink highlights surely gave them reason to pray. Praising God for THIS rainbow in the sky! 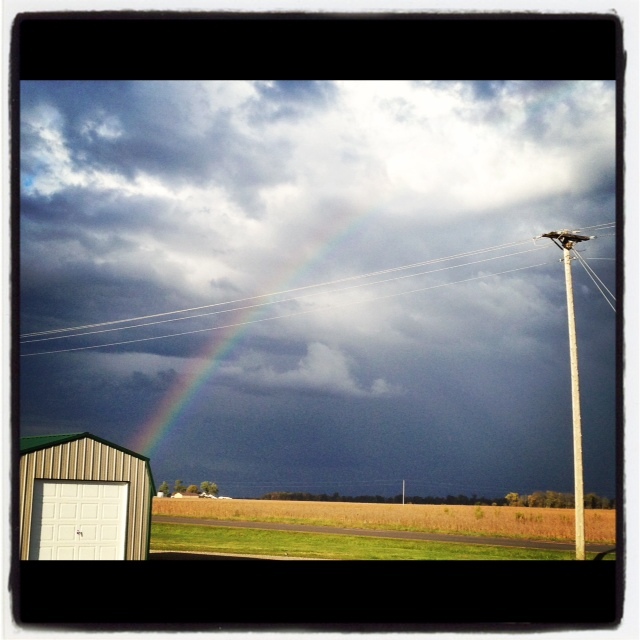 As we returned to our car, it was my sweet Ike who pointed in the sky…”Look, Mama! A rainbow!” Sure enough off in the distance that beautiful reassuring arch (not McDonalds!) blazed through the powder blue sky. I had been seeing gray patches of nothingness that only held fear and pending death. My son had been in the car with me and I was gripped with anxiety. It was when I paused, physically and emotionally, that the Lord provided a symbol of His presence. God knew at just the right time when I needed to see a sign of His glory. What a beautiful sight! Someone was giving you a sign for sure! Yes He did and I’m still trying to understand the other experiences we had on this journey. Many signs and wonders. Grateful for your sharing. God is so good. Thanks for stopping by. The Lord placed His hands of protection upon my boy and I, it has taken me two weeks to be able to write about it. Bless you! What a frightening journey! I grew up in snow country, so I have a couple tales like this of my own. I love that you said God’s reminder came when you were ready to look. Thank you Tiffany! You know what is the really incredible thing? I didn’t come to this revelation fully until I wrote FMF. I lived in suburban Chicago for half my life and I never have liked driving in the snow. God’s hand of protection is something we take for granted all too often. Thanks for stopping by! Bless you and your words!